Rembrandt Harmensz. van Rijn, detail from Christ Preaching (La petite Tombe) (ca. 1652), etching, engraving, and drypoint on laid paper, 15.5 x 20.8 cm. Image courtesy C.G. Boerner, New York. 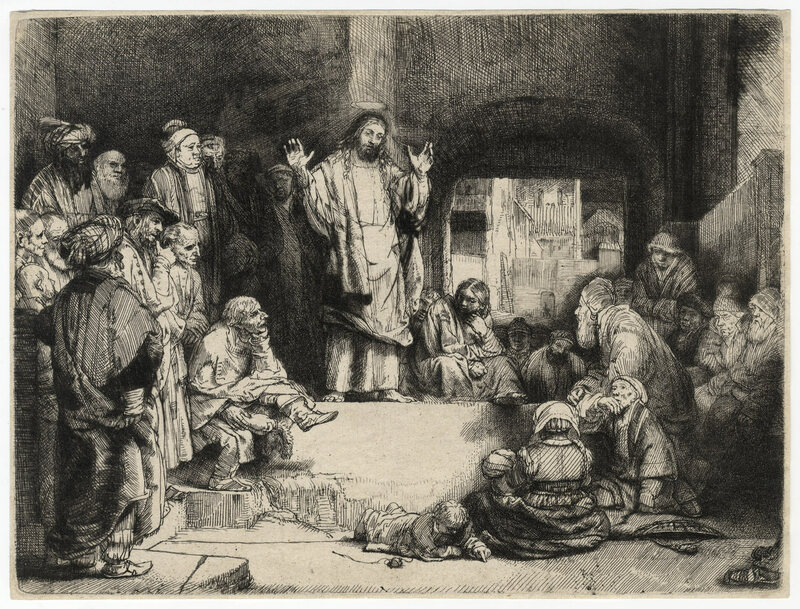 Rembrandt’s etching of Christ preaching (the so-called La petite Tombe)1 is a fairly common, though much celebrated, print that clearly had wide appeal during the artist’s lifetime. It compresses the qualities that the more overtly theatrical and legendary Hundred Guilder Print presents on a far larger stage. I prefer its intimacy, and it has been one of my favorite works of art since Ruth Magurn and Jacob Rosenberg kindly pondered it with me when I was a graduate student at Harvard years ago. 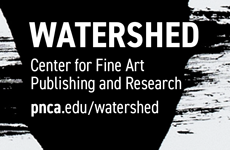 As an artist I am interested in how other artists do what they do—how they make tried and true, even tired, subjects their own and renew them through lively technical skill and/or conceptual invention. 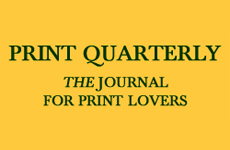 In the case of Rembrandt, though, identifying the means by which the result is achieved typically fails to fully explain the visual and emotional impact of that result. As a whole, La petite Tombe is valued most in its drypoint-rich, “black sleeve” impressions, but a technical insight to its success is revealed in the “white sleeve” later pulls.2 In these impressions the dark, obscuring veil of ink-retaining burr has disappeared and the earlier, operatic stage set is blasted with a clear light that enables the viewer to see the unadulterated linear underpinning. This unadulterated drawing is the skeleton for what might be termed the “stage lighting” of the richly contrasted drypoint impressions. Whether veiled in the dark recesses created by drypoint or clearly articulated in the white sleeve impressions, this capital effort by Rembrandt offers many areas of superlative artistry. Rembrandt Harmensz. 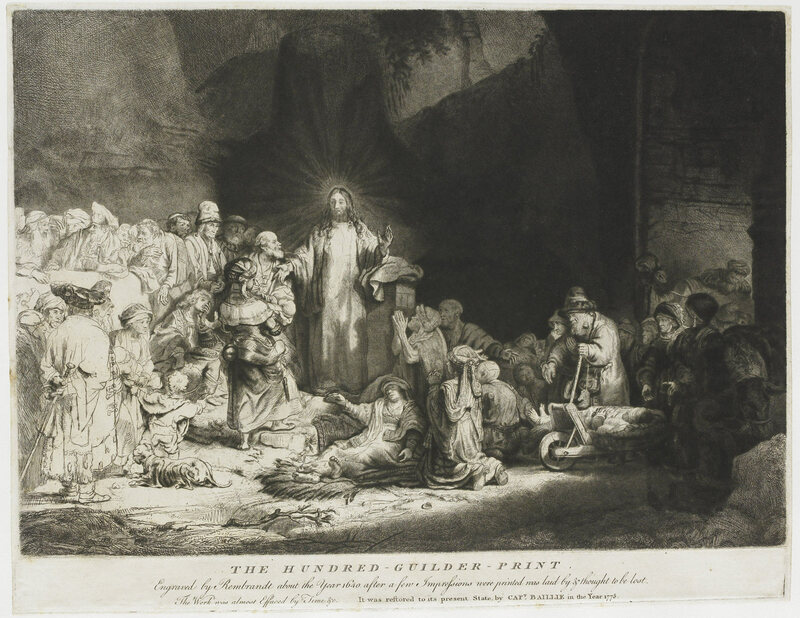 van Rijn, Christ Preaching (The Hundred Guilder Print) (ca. 1646–1650), etching and drypoint, 28.1 x 39.8 cm. Rijksmuseum, Amsterdam. In the artist’s rendition of this most serious moment, the passage that has always delighted and fascinated me is that of the child. How singularly unlike the other figures is that young boy lying on the ground. All the others are adults, standing or sitting rapt in attention and attired in garments suggestive of exotic biblical lands. These figures occupy and compress the space around Christ, giving his central presence the appropriate drama and compositional gravity. But the young child whose form terminates the arc of concave shadow on the right is preoccupied with making or tracing a line with his finger in the dirt. Most probably the child of someone of the crowd, he has been left alone to doodle in the dust; to his side lies his little ball of string. He is effectively a timeless child, distinguished not only by physiognomy, but by being depicted as in his own little world. 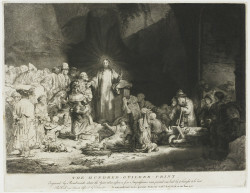 Rembrandt makes his Bible stories human by such touches of the quotidian, even in the most divine of gatherings. This is a detail that, three centuries later, we can easily recognize and isolate in a depiction that is otherwise imagined as ancient in its entirety. Rembrandt Harmensz. van Rijn, Christ Preaching (La petite Tombe) (ca. 1652), etching, engraving, and drypoint on laid paper, 15.5 x 20.8 cm. Image courtesy C.G. Boerner, New York. 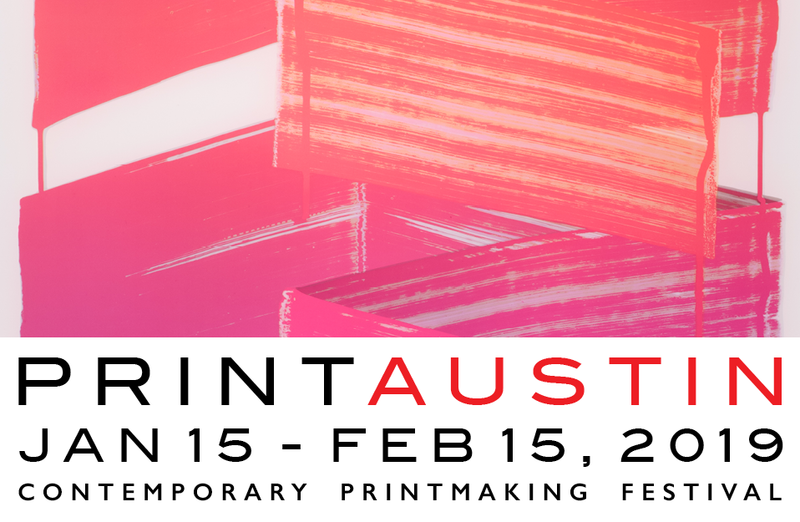 The print employs parallel lines that seem surprisingly widely separated and coarse for a work that is relatively small and intended to capture a range of intense, though subtly drawn, emotions. This treatment is obvious in the child, whose head and right side are in shadow, and continues on the ground at the right and at the bottom of the composition. It is almost as if Rembrandt gave himself a stylistic handicap (which he then overcame, seemingly without effort). Just as the boy’s form takes the viewer outward from the arc of shadow encircling the central event, his apparent obliviousness to Christ provides a kind of relief, a little chuckle perhaps, as the viewer’s attention is also allowed to go off point. It contrasts a spiritual moment in an ancient world we can only imagine with the ageless and familiar private concentration of a child. 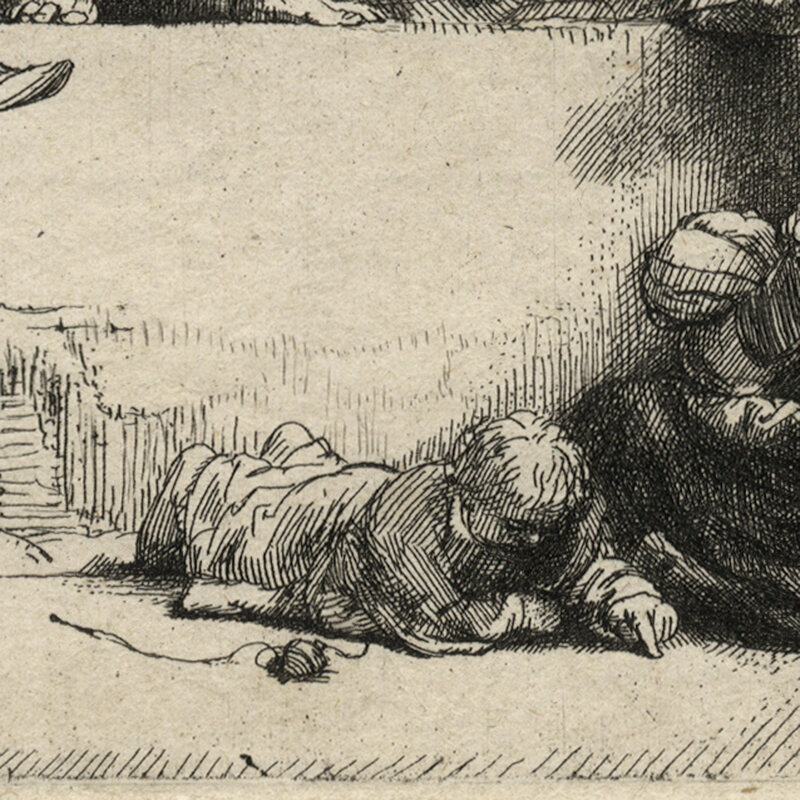 La petite Tombe is one of Rembrandt’s supreme graphic efforts in terms of technique and imagination; in deftly humanizing his exalted subject he has heightened its impact by incorporating a passage that paradoxically offers relief from that very exhaltation.